This is a fairly widespread and simple irrigation method that uses hoses instead of pipes, usually in PVC or polyethylene (PE). It is above all recommended and used since these materials have been produced at industrial scale. PVC accounts for two thirds of the water distribution market in certain countries like the United States. It is particularly well suited to this purpose given that it is lightweight, very strong and with low reactivity. PVC hoses can be assembled using different solvent adhesives capable of creating lasting assemblies that are virtually impermeable to leaks. Lastly, PVC hoses are highly resistant to ultraviolet rays and are therefore protected from damage caused by light. PVC hoses can be used in all types of irrigation systems. One particular, more sophisticated but also more costly form of irrigation uses hoses of this type that are perforated at the plant positions. 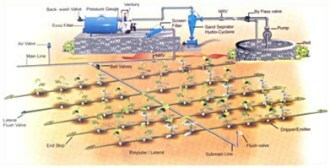 This is micro-irrigation and is described in sheet E 53 "Micro-irrigation". In the next part of this sheet, we shall look especially at micro-irrigation as it is the system where PVC hoses are used most frequently. It is particularly easy to understand and implement but can give rise to the use and execution of more complex irrigation systems. 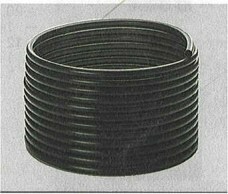 Drawback : metal pipes remain preferable in cases of very high resistance or when dismantling operations are necessary. PVC hoses have many advantages over other materials. It is a well-developed product that is easily available on the market. There will therefore be no problem in procuring supplies of PVC hoses when constructing an irrigation system or simply to convey water somewhere.